Documentary. 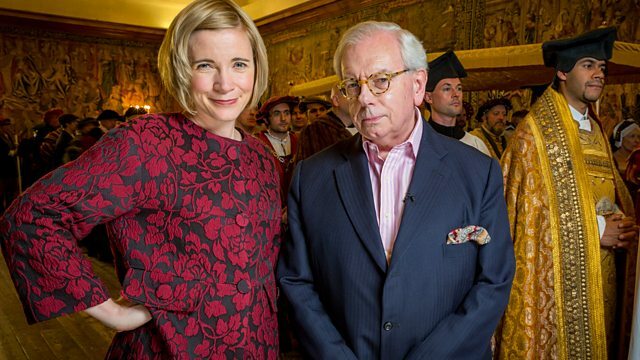 Lucy Worsley and David Starkey celebrate the 500th anniversary of Britain's finest surviving Tudor building, Hampton Court. Lucy Worsley and David Starkey celebrate the 500th anniversary of Britain's finest surviving Tudor building, Hampton Court. As Henry VIII's pleasure palace, Hampton Court was a showcase for royal magnificence and ceremony - and the most important event of all was the christening of Henry's long-awaited son, Prince Edward, on October 15th, 1537. Lucy and David explore how Tudor art, architecture and ritual came together for this momentous occasion. Drawing on historical records and with the help of a team of experts, they recreate key elements of the christening ceremony - including a magnificent set-piece procession through Hampton Court involving nearly 100 people in full Tudor costume. Costume supervisor Ninya Mikhaila on sourcing the wardrobe for the programme.